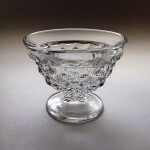 This is the Fostoria American Footed Dessert, with a Hexagon Foot. Out of the several dessert dishes that I talk about, this is the only dessert dish that has a hexagon foot. 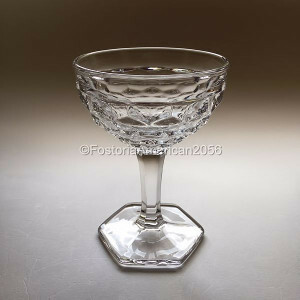 There are other pieces in the Fostoria American line; however, that have a hexagon foot – such as the 10 oz. Goblet and 2½ oz. Wine. The hexagon foot is a polygon with six edges and six vertices. While there are published books that refer to this piece as a “Sherbet” – I do not. The reason I do not is because it was never classified or named a Sherbet by the Fostoria Glass Company. When they introduced it in the 1930’s, they called it a “Footed Dessert”. Later on, as years passed, they started calling it a “Footed Dessert, (Hex. Foot)”. 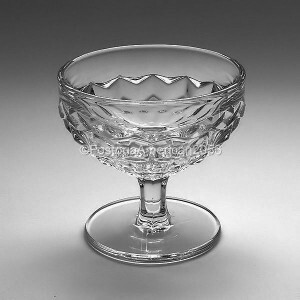 The Sherbet dishes were first introduced in the 1920’s, and this particular Footed Dessert dish was not introduced until the next decade. 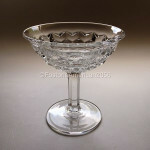 I feel the Fostoria American Footed Dessert, with a Hexagon Foot, is a bit more elegant than the Regular High Sherbet. The Footed Dessert holds approximately 4½ ounces, and is slightly taller than the Regular High Sherbet by about ¼”. The Footed Dessert is about 4¾” tall. The Footed Dessert was made for many years, so you should be able to locate them today without too much difficulty. 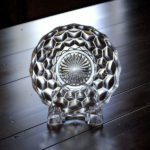 If you are interested in learning more about current availability and pricing for this piece, please click the following sponsored link for available Footed Desserts on eBay. 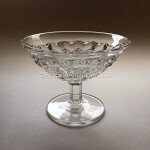 Just remember, some people refer to these pieces as “Sherbets”, “Wine” or “Champagne” glasses. You might need to modify your search criteria to see if more inventory will pop up in your search results.